Over the last few days a red fox has been seen in the grassy areas around the blacktop on Tiffany Park Court. Several residents have called Animal Control to report the fox. At this time, Animal Control will not take any action to capture or remove the fox. Animal Control has stated that the fox shows no signs of rabies or other issues. If the fox was rabid, it would be highly aggressive and not hesitate to attack humans or other animals. Animal Control believes the fox may have a den in the area, and is harmless. Furthermore, a fox in the open during daylight hours is not unusual. 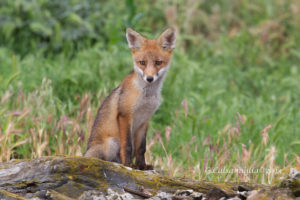 Due to expanding populations of both humans and foxes, the animals are being seen more often during the daylight hours. At this time, we ask that you do not contact Animal Control UNLESS the fox shows signs of aggression. However, if you do notice signs of aggression contact Animal Control immediately. Do not attempt to approach the animal or catch it. As this is a wild animal, we recommend all residents exercise caution in the area, particularly with children and animals. Photo “Little red fox” belongs to Giuseppe Calsamiglia. Photo used under Creative Commons (CC BY-ND 2.0).